An amazing spell of six goals in 15 second-half minutes - including four by sub Jimmy Muitt - gave Rocks fans a night to remember as they humiliated rivals Whitehawk with a Velocity Trophy rout. It was 2-0 with 26 minutes - then all hell broke loose as sub Muitt led a stunning demolition job on the visitors from Brighton. Muitt will take the headlines but it was Tommy Scutt who set up the stroll with a double, with Doug Tuck and Harvey Whyte also weighing in with lovely finishes as the Hawks fell apart. The Rocks fielded two youngsters making their debuts - keeper Jordan Matthews, who has been dual signed from Chichester City, where he has had a fine start to the season, and attacking midfielder Joshua McCormick, who has been on Pompey's books and played for Blackfield and Langley. Bognor were fastest out the blocks and Brad Lethbridge ran on to a through ball to force keeper Jordan Hawkins into a good low save. Whitehawk replied with a quick attack that ended with Thomas Cooklin shooting low but just wide on eight minutes. Debutant McCormick tried the spectacular when he met a floated ball beyond the far post on the volley - it flew high and wide but he was offside anyway. Aaron Goode surged forward for the Hawks and fizzed a long-range shot just wide - before McCormick sent Lethbridge clear one on one with the keeper, who produced a top-class save to deny the Pompey youngster. Scutt volleyed goalwards from 25 yards but it curled just side of Hawkins' right-hand post. A flowing Rocks move saw Lethbridge play McCormick in on Hawkins but the keeper was equal to the shot once more, getting down quickly to parry his right-footed shot. Walsh went on a brilliant run midway through the first half into the six-yard box from wide on the left but eventually lost control. But the Rocks came again straight away as Tuck passed to Scutt, who took a touch before sliding a nice finish past Hawkins for a 1-0 lead. Lethbridge's persistence in trying to meet a cross from the left almost earned him sight of goal but the Hawks crowded him out. Whitehawk should have levelled on 32 minutes from a free header from a corner. Then Lucas Rodrigues ran at the Rocks defence but shot over from 25 yards. The visitors were looking increasingly threatening as the half went on but couldn't find an equaliser. Whitehawk caught Bognor napping in the opening seconds of the second half and Cooklin flashed a shot across Matthews' goal and not far wide of the far post. Bognor had just a good a chance at the other end straight away but Lethbridge's volley from a lovely Joe Tomlinson cross was horribly wide. Soon Lethbridge ran through again and shot well across Hawkins but wide. It was 2-0 on 51 minutes as Lethbridge streaked away down the left and crossed perfectly for Scutt to bundle in his second from close range. Bognor immediately brought on Charlie Osborne for Corey Heath. Whitehawk were still creating chances but were wasteful in front of goal - Ashley Mutongerwa next to spurn a chance when he bent a 20-yard shot way over the bar. 3-0! 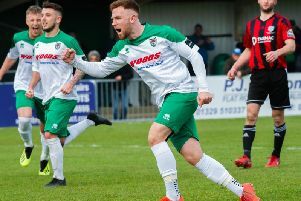 Bognor went three up on 64 minutes with a beautiful finish from Tuck, who curled a shot left-footed and just inside the post from the edge of the box when a corner was played to him. 4-0! Sub Muitt got in on the act a minute later, turning and firing in after a move down the right. 5-0! Then almost from the restart the other sub Whyte ran through and squared to the unmarked Muitt, who was never going to miss. 6-0! The fun didn't stop there. Two more minutes had passed when the ball fell to Whyte in the box and he took a touch to line up his shot then arrowed it into the top corner. The Rocks had scored four goals in five minutes and looked like they wanted more. Whitehawk didn't know what had hit them. Whitehawk made two more changes with 19 minutes left in what could only have been an attempt to stop the rot. Rodrigues was replaced by Harry Shooman, Cooklin by James Waters. 7-0! But the rot didn't stop there for the visitors from Brighton, whose management were getting angry on the touchline, their mood not helped by Muitt completing an eight-minute hat-trick. 8-0! Whitehawk were in complete disarray and Muitt was in splendid isolation as he ran though to slide his fourth past Hawkins - that one coming on 79 minutes, just 19 minutes after he had come on. It was almost nine as Davies curled a low 25-yard free-kick just wide. Then Scutt was so close to completing his hat-trick but was just wide with his effort. In the 89th minute a Tomlinson cross was headed off the line by a defender as hopes of double figures receded. Well you can't have everything. There was no more goal action to come - the job was done and the Rocks will visit Kent side Hythe in the next round. Next up for them is a home FA Cup second qualifying round tie with AFC Sudbury this Saturday. Rocks: Matthews, Davies, Tomlinson, Tuck, Field, Heath, Scutt, Block, Lethbridge, McCormick, Walsh. Subs: Osborne, Muitt, Whyte. Whitehawk: Hawkins, Marsh-Brown, Broughton, Emberson, Drage, Goode, Cooklin, O'Neill, Rodrigues, Mutongerwa, Sisimayi. Subs: Moore, Waters, Malila, Walsh, Shooman.